Solar lights are a great choice to light up your deck, garden, pathways or even your swimming pool. They may be the final decorative detail for your porch and pinpoint your favorite decorative items: statues, water features or some interesting deco setting. There are plenty of models out there and not all solar lights are good for your deck. You may want to check the lumens on the lights as they sure tell you a lot about the level of brightness. Don’t get tempted to get many lumens though as in some cases a high level of brightness isn’t the best choice. Lower brightness minimizes glare, whereas higher brightness covers a larger range of areas. You can go for solar deck lights that come in strings or sold alone. The bigger the area, the more solar lights you need. Check the batteries on your deck lights also as you want them to recharge and to replace them when in need. You want a good capacity of batteries as too low may bring overcharge. It’s always nice to have adjustable deck solar lights and you may want to add motion detection, for instance, in some areas. 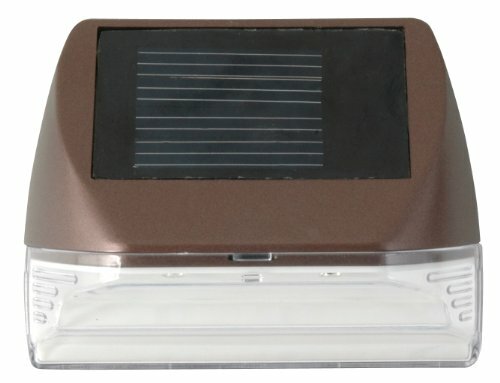 The range of the solar deck lights is always important and you should go for the models that covers your deck in the best way. 1). 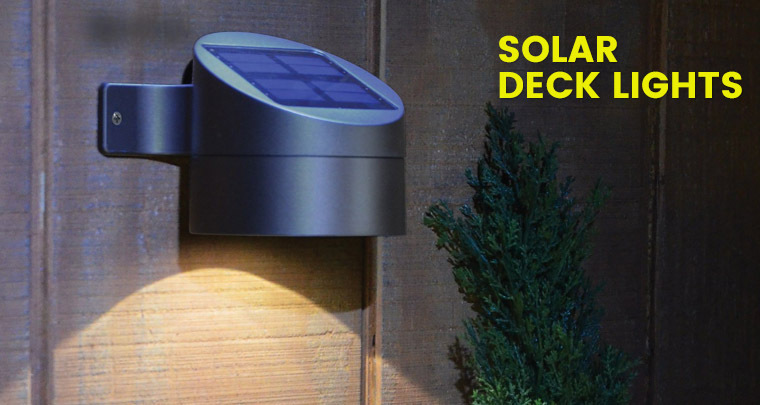 Small and looking nice on any deck, the Moonrays 95028 Mini Solar Deck Light Wall Mount Sconce is one option to go for especially if you go shopping on a fixed budget. The scone includes 2 LEDs that give a nice, white light to illuminate your deck or pathways. It comes with AA NiCd battery that charges throughout the day from the sunlight. The battery turns on the LED bulb inside automatically at dusk. The solar panel is efficient and charges the battery even on a cloudy day. It’s easy to install the scone to most solid surfaces as it comes with wood screws. The build of the scone is good and it’s made with bronze plastic that is rust and weather resistant. The plastic lens is clear so the light is nice every time. The scone looks good and manages to deliver, despite its low price. Apart from the inherent flaws, the scone is a good choice for any deck, giving a nice light for quite some time. 2). 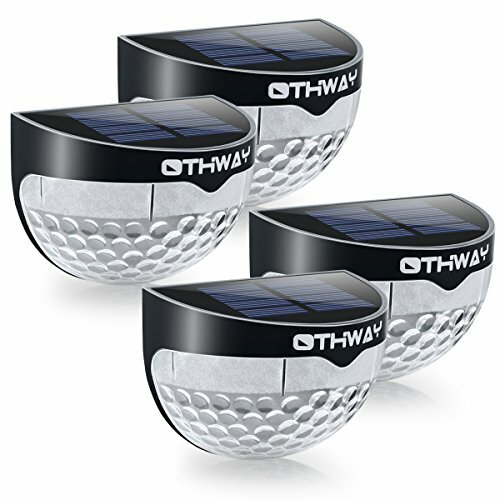 The cute design of the OTHWAY Solar Fence Post Lights Wall Mount Decorative Deck Lighting is one of the things we like the most on these lights. The decorative lights present a honeycomb type cut in the plastic cover, which explains the nice light effect they give on any deck. The lights aren’t just about the looks though and we sure have to go over the other features as well. The lights come with build-in sensor and automated switch so the light turns on at night and off when the dawn comes. The construction of the lights is another good thing as they are made of long lasting plastic that takes the elements pretty good. The material is waterproof, heatproof and has a good stability. The lights handle wind, rain and even a snow. The bulbs use SMT LED so take the long lasting use. The solar panel is efficient and the batteries charge with smaller amount of sunlight as well. The batteries the charge pretty well also. The lights are easy to install and don’t include any wires. They work well and light up your deck very nice. Cute and efficient, the solar lights still manage to be a reliable option for any deck. 3). 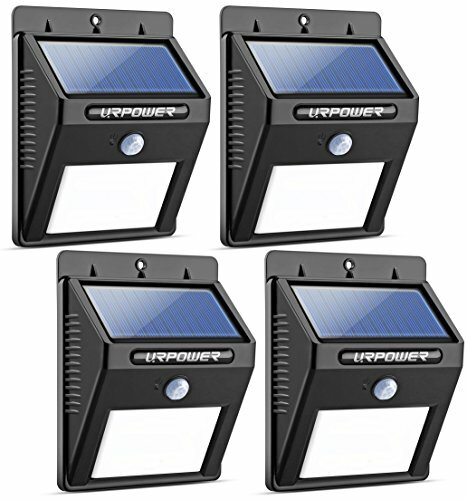 Easy to install and bright, the URPOWER Solar Lights 8 LED Wireless Waterproof Motion Sensor Outdoor Light for Deck stand out as some of the most popular lights for deck out there. You only needs a few seconds for installing the lights as they don’t imply any wiring whatsoever. They are solar powered and made for the outdoor use. The lights include an automated switch and turn on at night when the motion sensor detects movement. They also turn off automatically once the morning has come. The build-in sensor is large and has a sensing range of 10 ft., whereas the sensing angle is an efficient 120 degree. The construction of the lights gives them durability and the lights have an IP64 waterproof grade, but are also heatproof. They take all kinds of weather and work for 12 hours after sunset. The solar panel matches the build of the lights and has a 5-year lifespan. It needs up to 8 hours for charging the batteries. The lights work well, are easy to install and give a bright light. Quite enough for some solar deck lights, right? Despite the minor flaws, for all the other good things they bring to the table, the lights are worth every single penny. 4). 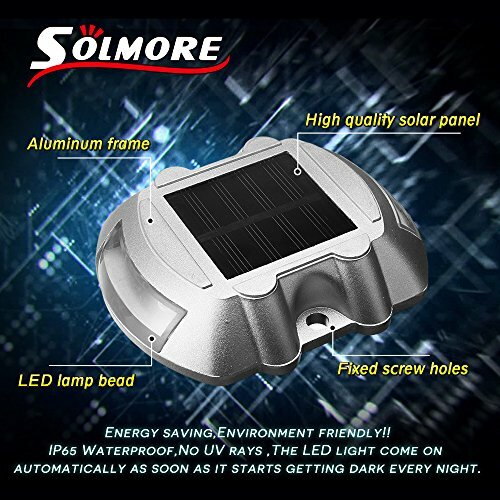 Automatically charging and lighting up your deck so efficiently, the Solar Deck Light,SOLMORE 4 Pack LED Solar Dock Path Road Lights Marker lighting are some deck lights you should go for your deck when in need. The lights include automatic charge and they charge throughout the day, illuminating once the dusk comes. They include 6 high quality LED bulbs that give very bright light for even 10 hours of night. The lights are environmentally friendly and don’t give any UV rays, improving the appearance of any deck. The build of the lights explains their durability and the lights have an IP68 waterproof grade. Furthermore, we notice the high-quality aluminum alloy-casting frame that eliminates risk for rusting. The battery compartment is tightly sealed, taking snow, rain and too strong sunlight. It’s durable, with minor risk for damage. You may safely use the lights both indoor and outdoor. The wireless setting up and operation make the lights easy to install and to use. You may install them flat on the ground or vertically and the medium sized screw holes insure stability for the lights. Especially made to withstand the difficult weather and some impact, the lights are worth the money you pay. Apart from the small problems, we really like the lights for their efficiency and impressive build, which makes them a great choice for any deck. 5). 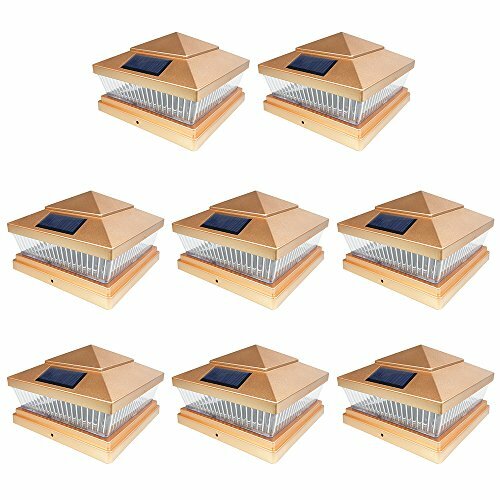 The elegant appearance of the iGlow 8 Pack Copper 6 x 6 Solar Post Light SMD LED Deck Cap Square Fence Outdoor Garden Landscape PVC Vinyl Wood Bronze is one of their best features, but the lights do bring a lot more to the table. The lights give a bright light and the LEDs present a maximum output of 20 Lumens. They come with AA 3.2 V batteries that easy to recharge. They are long lasting and may hold even 3 years of use. They hold their charge pretty well too. Another thing we like on the lights is the automatic sensor that activates at dusk. The solar panel is improved and efficient, providing better charging performance. The build of the lights explains their lifespan and the lights are weatherproof. They handle natural elements, for a long time. As they don’t include any wiring for installation, the lights aren’t difficult to install. For more versatility, they also come with fence and post attachments and parts. Looking nice and giving a bright light on any deck or area, the lights are a good investment any time. Nice looking, dependable and bright, the lights are a good buy, no matter how we put it.